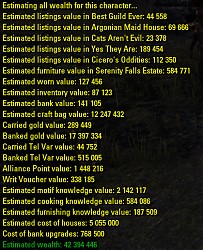 This addon will take the value of the items in the active toon's worn equipment, inventory, bank, craftbag and guild listings and try to give you a net wealth. You can also set custom values for AP, Tel Var and writs. Allows estimating the cost of your current motif, recipe and blueprint knowledge. The main command is /wealth. There is also /wornsum (equipped), /bagsum (inventory), /banksum, /craftsum (Craft Bag), /hbanksum (House Bank; must be done in house). I think they are somewhat self-explanatory. /motifsum will calculate the current character's motif knowledge value. /recipesum will calculate the current character's cooking and furnishing knowledge values. /stolensum is a special case: it is automatically called when a guard is trying to arrest you and it gives both the MM value of your items and the vendor value, since many stolen items cannot be traded. It only applies to what is worn/carried as they are the only items at risk. The other commands already sum stolen tradable items in the normal sum, while this is more specifically for knowing risk. /bankdump - lists banked items for non-plus slots. 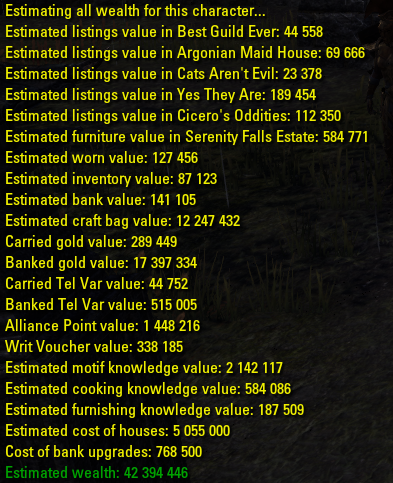 /bankpdump - list of the banked items in your ESO+ slots. /hbankdump <#> - enter the bank # (1-8) that you wish to dump. Only works in house, unfortunately. Craftbag doesn't have a dump because of several reasons that I'm too lazy to list. Wealth, Worn, Bag and Bank have three variants of the command. The "all" command is simply the default one. If you want bound only you add "b" if you want unbound only you add "ub" For example, the worn command is "/wornsum" if you want unbound only, use "/wornsumub" Craftbag doesn't have a bound/unbound option because I don't think there's anything bound that goes in there that would have value. If I'm wrong, correct me and I'll add it. Guild listings must be viewed before the game allows you to be aware of them. All this means is that if you want your guild listings included in the wealth evaluation, simply view each of your listing pages (the items must appear; if the listing is blank because it didn't load, it won't work) before using the wealth command. This uses the value you listed the item at rather than the MM value because what you have listed it for is more relevant to you. You must enter the house with "automatic furniture sum" enabled or call the /furnsum command to add a house's current furniture value. The former only works on entry, so if you want to be totally up to date, call /furnsum before you leave (if you made changes). For now, it will not differentiate between bound and unbound house items because I don't currently feel like handling saving that mess. Later on, I will probably change the way it stores housing info so that you can more easily switch between bound and unbound. ZOS made this data only accessible when you've opened them that session and are in your house. So if you use the /wealth command and see it says 0, that's why. This may seem confusing for some people because it looks more complicated than it is, so feel free to ask. If you just forgot a command, you can always use /wehelp for a refresher. You can use /weoptions to go to the addon settings page. Thanks to @Jiub's_Zealot for testing the early versions. *Devs: WealthEval can be used to call many of the functions. Version 1.07 - fixed double spaced text. Version 1.05 - uses vendor value for items without MM. Version 1.04 - API bump. Version 1.03 - added risked stolen items sum. Version 1.02 - craft bag fix. Version 1.01 - added unknown listings on individual checks. Re: Re: Re: ATT or TTC Support? Any plans to add support for ATT or TTC? Eventually, but this update is keeping me busy on multiple addons. I've been busy for quite some time, but with the introduction of LibPrice, I could quickly add support for those. That error is implying your bank is empty or possibly has no value, but I doubt that is the case? Could you give me your saved vars file? Could you tell me all of the houses you own? That stack trace is showing the code working properly (not your fault). Re: Re: ATT or TTC Support?